Add an ISE instant hot water tap to your kitchen and get ready for instant near-boiling water at the pull of a lever. The modern kitchen is the heart of the home. It’s a place where we all love to gather and spend time with friends and family. Space and time are constantly in demand. So we all need clever ways to simplify cooking and de-clutter the kitchen. InSinkErator steaming hot water taps dispense instant near-boiling at the pull of a lever. From making hot drinks in seconds, boiling eggs or making fruit easier to peal. 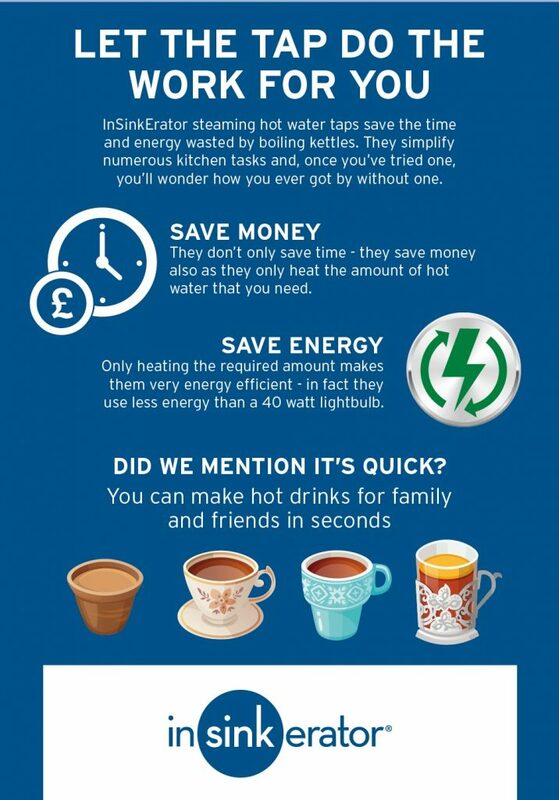 There are countless benefits to be had from installing a steaming hot water tap in your kitchen. 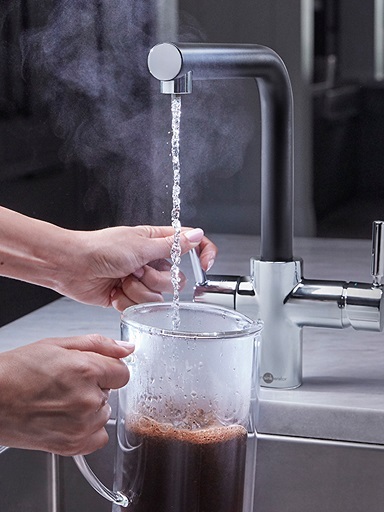 A steaming hot water tap from InSinkErator® means no kettles, no clutter and no fuss. Just steaming hot and cold filtered water (on certain designs) at the pull of a lever. With elegantly sleek lines, InSinkErator® hot water taps add style and convenience to the kitchen. Each of ISE’s hot water tap models offers something slightly different. Some dispense filtered cold water as well as filtered steaming hot water, whereas other models only offer the steaming hot option. Whether you are looking for an all-in-one steaming hot water solution or a dedicated contemporary hot tap to sit neatly alongside your main kitchen tap. InSinkErator have the choice for you.